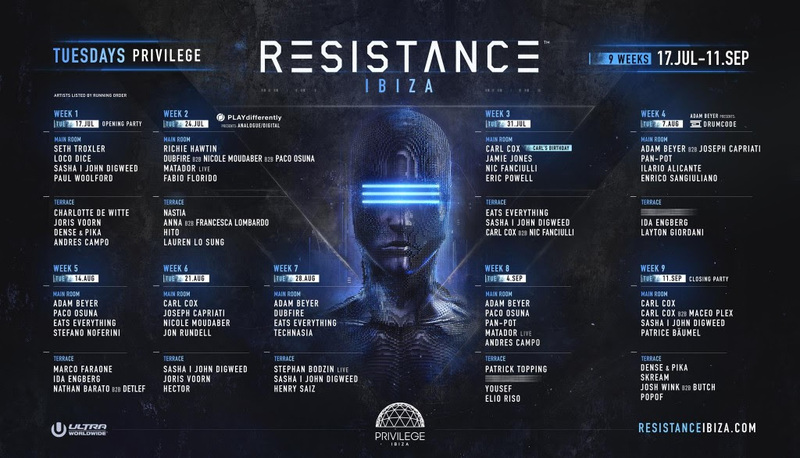 RESISTANCE Ibiza has just announced the full line-up for its mammoth nine-week residency at the biggest club in the world, Privilege. The monumental residency will begin with the Opening Party on July 17th and runs every Tuesday until the massive residency closing party on September 11th. Guaranteeing a Closing Party to remember, the nine-week celebration will wrap on September 11th with Carl Cox reclaiming his throne for a solo set and a first time B2B with Maceo Plex. Sasha | John Digweed and Patrice Bäumel will also grace the Main Room decks. Dense & Pika, Skream, Josh Wink B2B Butch and Popof will simultaneously take over the decks on the Terrace to cap off the immense season. View the full lineup and program below. Tickets for all nine RESISTANCE Ibiza parties go on sale on May 9th.